Oh, they did it again. Yesterday’s Instagram rant of the new songs of summer collection by Anita Dongre showed me two things. 1. Nobody can do better summer weddings than Anita Dongre and, 2. more importantly, I can never get over the cuteness of Shahid + Mira. Let’s focus on point two for today. 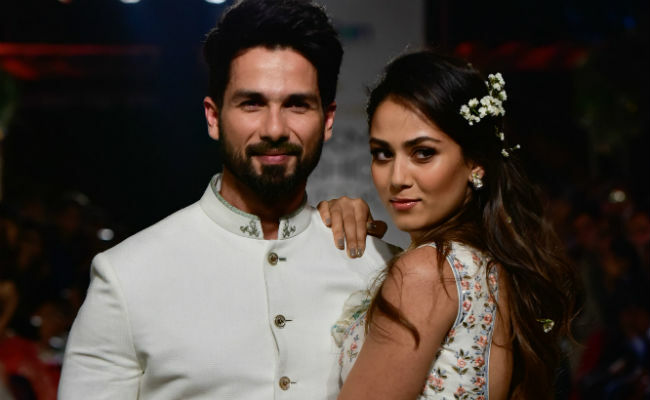 Shahid and Mira did their debut walk as showstoppers at the Lakme India Fashion Week Summer Resort 2018. No surprises to guess, they looked one hell of a luvy-duvy pair. Wearing beautiful Anita Dongre outfits in white, the couple looked so effortlessly in sync not to mention gorgeous ! Shahid wore an elegant ivory white bandh gala sherwani. While Mira wore a matching ivory white floral printed lehenga choli. I am usually one for colors and pop, but this understated muted tones in Anita Dongre’s latest collection has my heart. It’s going to be interesting to see brides pick and choose from the songs of summer collection. And, now the cutest videos of #Shamira. Heart = melts! How much does Mira Kapoor Lehenga cost? Isn’t that priced at a steal deal?! INR, 1,29,000 for that showstopper gorgeous lehenga. Comment below if you’re loving this look on Shahid and Mira.